Posted on December 9, 2014 at 6:45 pm. So what is so good about online casinos? Can’t you play all the same games at a bricks and mortar casino? Not exactly. Online casinos offer unique games you will not be able to find in land based casinos. On top of that, you can often find improved odds online, you don’t have to battle other punters for the table or pokie you want and online casinos offer huge sign up bonuses and promotions. G’day Casino is not only offering you a 100% unlimited matched deposit bonus and a free slab of VB beer when you make your first real money deposit of over $100, but now the site is also offering new punters 50 free spins on the brand spanking new Net Entertainment slot game, South Park: Reel Chaos. You’ll be hard pressed to find a land based casino that will offer you a free slab of beer, cash back on what you spend, matched deposits and free games. 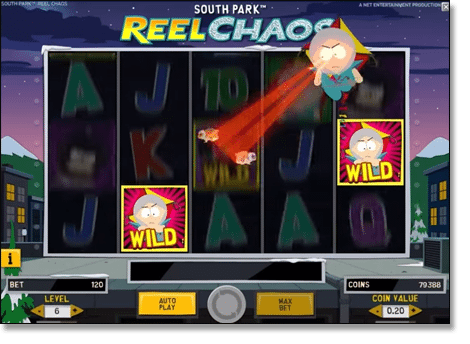 I decided to take advantage of the fantastic G’day Casino offer and played out my 50 free spins on South Park: Reel Chaos. To claim your 50 free spins, no deposit is required, all you have to do is sign up and create an account, which is quick and easy (name, email, password, date of birth, etcetera). Reel Chaos is a new game from gaming software developer giants Net Entertainment loaded with four different randomly triggered character bonuses throughout paid plays, and an Epic Bonus Spins feature game as well. NetEnt created this game in cahoots with the mad minds of South Park Studios and the final product is engrossing and thoroughly entertaining. During my 50 free games on South Park: Reel Chaos, I managed to jag myself two of the randomly awarded features. First, I won the “Kyle Overlay Wild Bonus” where Kyle – the Human Kite – floats around the reels and awards a sticky wild wherever he lands. Several spins later I was randomly awarded “Kenny’s Multiplier Bonus”, which is essentially a wheel of fortune style bonus feature. The other two randomly awarded bonus features are “Stan’s Multiplying Re-Spin Bonus” and the “Cartman Stacked Wild Bonus”. From there you could have bowled me over with a feather when I managed to trigger the Mintberry Crunch Feature which is achieved by spinning the Mintberry Crunch symbol on reels one, three and five. During the Mintberry Crunch Feature, you face off against an array of South Park villains – the Evil Minions, General Disarray, Professor Chaos and the anime version of Professor Chaos. When the dust had settled and my 50 free spins were over, I had managed to win myself $36.58 (AUD) – a decent reward from a free 50 spins at $0.20 per spin. I was later able to turn my free $36.58 bonus credits from the South Park: Reel Chaos spins into $58.08 after playing several other great games at G’day Casino. Emu Casino is another nifty online gambling site offering a matched deposit bonus up to $1500, up to 25% cash back on what you spend on the pokies, as well as 10 free spins on the popular and unique BetSoft pokie Rook’s Revenge as soon as you register an account (free of charge). All you have to do to take advantage of the Emu Casino Rook’s Revenge 10 free spins promotion is sign up – again, no need to deposit any funds. Provide details such as your login name, password, mobile number, email and date of birth, and once you have completed the registration process, Emu will send a confirmation text message to your phone. Submit the code and you are ready to go. 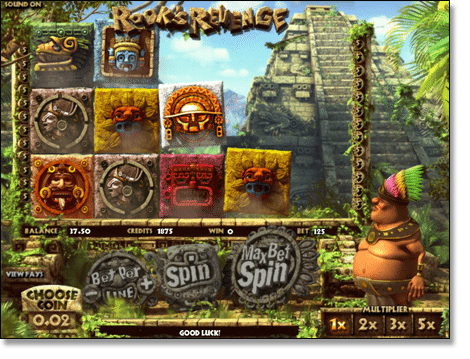 Rook’s Revenge is a BetSoft brainchild and sequel to the wildly popular Aztec Treasures. Rook’s Revenge varies from most conventional pokies in that the reel symbols are blocks falling from the top of the playing screen. When a winning combination is formed, the winning symbols/blocks explode and new blocks fall into place. With each consecutive win, a multiplier situated in the bottom right hand corner of the screen increases up to four times. At the end of my 10 free spins, I managed to amass a small fortune of $4.51 – far smaller than the rewards from the South Park: Reel Chaos game, but there are fewer free spins here, so it wasn’t too bad. Every cent counts. What is important is to maximise your chance at amassing as many free spin promos as possible – all without the need to deposit cash, so with great offers like these, we recommend registering accounts at both www.EmuCasino.com and www.GdayCasino.com, just as you would register accounts with multiple bookmakers to take advantage of the best odds. These online casinos also tale care of you with other special promotions on a constant basis, have hundreds of pokies, table and other games, and are compatible with all smartphones and tablet – you might not want to head back to a brick and mortar casino after this online interactive experience. Sign up and take advantage of these amazing offers. Good Luck.